Having a neat wardrobe might be a simple dream for some people, especially for those of you who have a busy activity schedule. You will forget the neat wardrobe when you are super busy. The impact is that you will feel when you choose clothes to attend certain events. By having a neat wardrobe, your life will be easier. Where you can know the clothes you want to wear along with matching bags and shoes without having to rummage through the entire contents of your closet. When you find a messy closet, there must be a lot of dust and dirt. Before tidying it back, it’s better to clean it first. In addition, separate clothes that are not worn. Better, the clothes are donated to those in need. With the variety of colors and shapes of your clothes, it makes you dizzy choosing it. Sometimes there are some clothes that escape from your sight so that the clothes are increasingly unused. You can categorize clothes by type first. 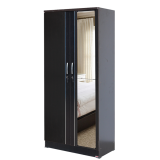 The LPT 026 model wardrobe from Lunar Furniture will certainly be the right choice to realize the wardrobe that is always neat and clean. Contact Lunar Furniture immediately at 021 54376 555/333 or click www.lunarfurniture.com.